What Does A Great Travel Experience Sound Like? Through its creative use of music, namely intimate concerts, Aloft taps into its guests’ passion to create a hotel stay that rocks. Aloft Hotels aims to provide their guests a deeper understanding of the destination they are visiting. One way: tap into their guests passion for music. There are so many elements that contribute to a truly authentic travel experience—the memorable places you visit, the local culture you experience, the residents you meet. While some affordable hotel chains prioritize predictability from one city to the next, others believe it’s a unique local experience that keeps guests coming back. Launched in 2005 as a stylish yet more accessible boutique hotel, Aloft Hotels aims to give guests a deeper understanding of the place they’re visiting. But with more than 125 properties on six continents, creating a program that taps into the local culture in each city is no small challenge. It requires creativity, passion, and a crystal clear sense of what the brand itself represents. Aloft’s answer is Live at Aloft Hotels, which brings guests together with musicians from both the local area and the national stage for intimate performances at the hotel’s W XYZ bar. In a recent interview with FastCo.Works, Bridget Higgins, senior director of global brand management for Aloft Hotels, shared how the music program came about and how it’s changing the guest experience. Live at Aloft Hotels performance, featuring The Veronicas. FastCo.Works: What’s different about the LAAH shows? 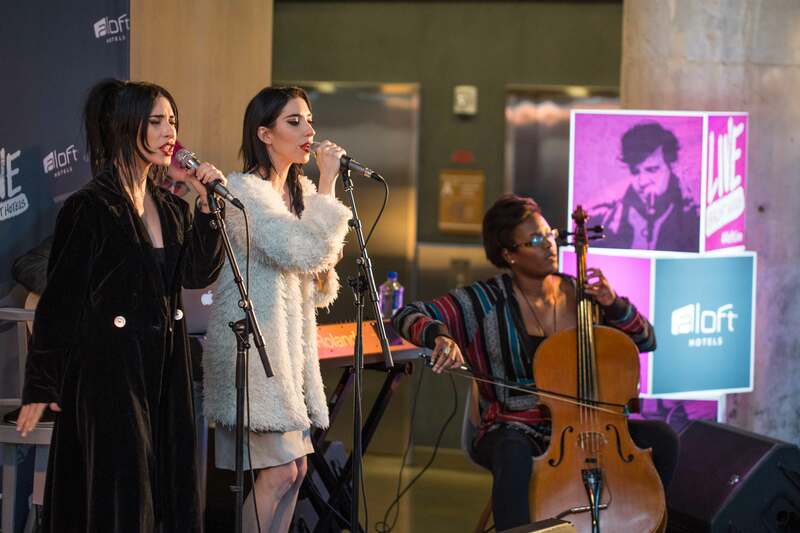 Bridget Higgins: Live at Aloft Hotels is a platform for our guests to connect with the local music scene, and to experience who’s new and next in music—whether they’re visiting Portland, Nashville, or Abu Dhabi. The artists run the gamut from young, local up-and-comers to more well-known performers like Bronze Radio Return or Ingrid Michaelson or Gavin DeGraw. The shows are free, and they’re not only for our guests—locals attend as well, especially when there’s a performer with a big following around town. In certain cities, the W XYZ bar has become a hot spot in its own right, especially on show nights. Live at Aloft Hotels is a time and a place where guests and locals come together to have a couple of drinks, hear some music in a really intimate setting, and often, meet the band and hang out after the show. FCW: What inspired the program? Were there consumer insights you wanted to tap into? BH: From the start, we’ve attracted guests who want to be somewhere fun, but at a lower price point than most boutique hotels. Aloft Hotels can be found in a variety of markets—in the heart of the world’s largest cities or in smaller markets and sometimes outside of the downtown areas. In these places, there was a lot of room to stand out in the select service market and bring something more unique, more tied to the culture of the city than your average chain hotel. Along the way, we learned that musicians and bands on tour were naturally gravitating toward us because of that social aspect, the stylish design, and the price point. At the same time, we were looking for new ways to activate our public space and tie in the local scene. It all made sense. You see some hotels offer a local craft beer, or hire a local chef, but we realized the thing that spoke the loudest about our brand, and what our guests were looking for, was live music. Aloft Hotels play custom playlists featuring music from Live at Aloft artists. FCW: What role does music play throughout a guest’s stay? BH: Music is a facet of the brand that goes beyond the live shows. It’s the first thing you notice as you walk into the hotel. We play our custom playlist throughout the open public space a bit louder than other hotels. It’s a big part of the vibe. We update the music throughout the space frequently and will include the bands that are playing on tour with us. We even ask the bands to create playlists featuring music they’re inspired by. We also promote bands from Live at Aloft Hotels through download cards that we give out at check-in, so guests can have access to a new song or album for free and can take that music home with them. 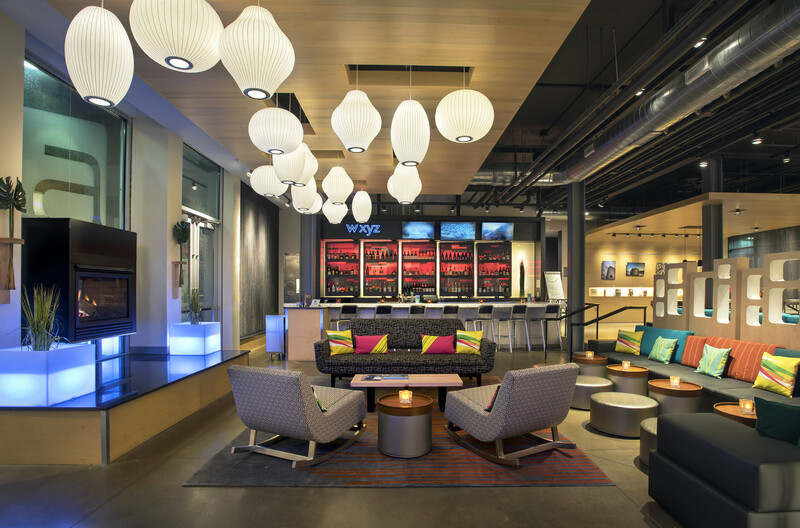 FCW: What can other brands learn from the success of Live at Aloft Hotels? BH: I think the reason we’ve been successful is because the music taps into a passion point for both the brand and the guests—it’s authentic. We approached it from a deep understanding of who our audience was and worked to give them an experience that’s meaningful to both them and us. We also benefit from strong partnerships. Our guests are the kind of people these bands want to get in front of, and we make sure the experience is really attractive to the bands. We’re not throwing money at people to get them to come play. Bands come to us a lot of the time and ask to be a part of what we’re doing. They understand there’s a lot more to Live at Aloft Hotels than playing in a hotel lobby. FCW: What do you hope guests take away from the experience? BH: Our hope is that they have a great experience. That they discover a new band or get to chat with an artist about a song they love. That they feel like they’ve discovered something cool about the city they’re visiting, something they can take back home with them. There’s a band called Blue October that’s played our stage maybe 20 times, and they have a very loyal fan base that turns out every time to see them close up at a small venue and to chat with them afterward. There’s a level of excitement as well as intimacy there. That experience is what we’re going for, whether you’re seeing a band for the first time or they’re already your favorite. To see who is playing at an Aloft Hotel near you, visit LiveAtAloftHotels.com.